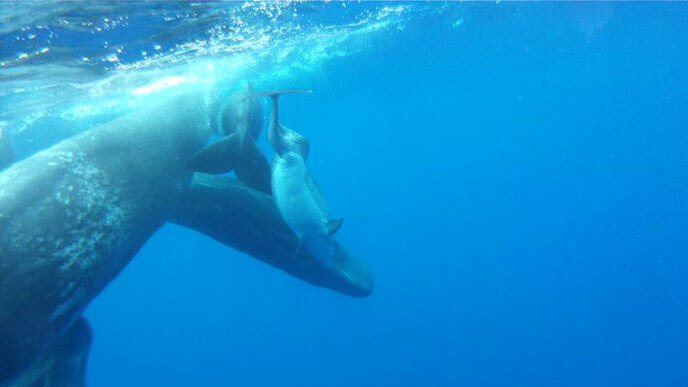 Researchers near the Archipelago of the Azores in the North Atlantic Ocean were astonished when they discovered a pod of sperm whales, a species known for its aloofness, which seemed to have adopted a deformed bottlenose dolphin calf. The dolphin suffered from a rare spinal curvature, which may have rendered it unable to keep up with other dolphins. The researchers observed the group over a period of eight days, in which time the whales not only allowed the calf to travel with the group, but were sociable and even friendly toward it. 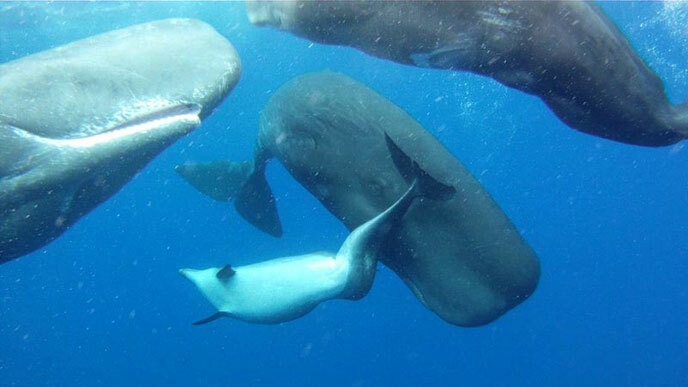 The little dolphin swam along directly in front of the open jaws of a sperm whale and, in the photograph below, can be seen nuzzling one of the sperm whale calves with its rostrum. Ecologist Alexander Wilson, who captured these photographs, told the Toronto Star the most likely explanation for the interaction was that the sperm whales and the dolphin are "friends". "The touching of flukes and nuzzling with the rostrum, these are all extremely friendly, social gestures for cetaceans to do to one another," he said. The researchers considered alternative explanations for the observed behaviour, for instance that the dolphin was seeking protection from predators. This explanation did not make sense in the environment of the Azores, however, where predators of dolphins are few. The researchers also contemplated whether the dolphin's foraging skills might have been useful to the whales. But this also seemed unlikely, given that sperm whales feed on squid 800 metres below the surface, whereas dolphins usually feed on shallow water fish. "Really, it seems that, somehow, either one or both parties derive some social benefit, whether it be social play, or just some way to relax and interact with another cetacean," Wilson concluded.